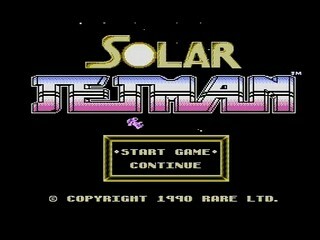 Solar Jetman was developed by Rare and released in the US in 1990 and in Europe in 1991. The almighty "golden warpship" has been disassembled by aliens and the parts have been hidden on 12 planets. The hero, Solar Jetman, must battle through these planets in the quest for recovering the lost parts and finally confront the evil mother alien once the warpship has been assembled. Partly due to the unique game mechanics for an NES-game (similar games exist for other platforms though) and the steep learning curve, the game has to be considered as fairly obscure. Best European version time With warps: 0:25:53 by Dag 'ktwo' Cato on 2012-11-17. There are 12 regular planets in the game and one "bonus" planet, which can only be reached by using a warp zone. I call it "bonus", but it's just like any of the other planets and is called planet 13 in the game. Anyways, there are two ways of finishing a planet. The easiest is to take a warp zone (provided there is one). The normal way is however to first collect enough fuel tanks for the mother ship to be able to take off to the next planet. That opens up a "large wormhole", which leads to a place where a part of the golden warpship is kept. The point of the game is to collect all parts of the warpship and then do a final shoot-em up like stage, which ends with the final boss. The whole logic breaks down when using warps, since many parts of the golden warpship are then not collected. However, we don't need to analyze that in more detail, let's just accept that that's the way the developers decided to make the game. The run I have made is one with warps. There are no meaningful collectibles in the game, so it's basically just a question of using warps or not. One could potentially throw death abuse into the equation. Deaths don't save time anywhere, but it could allow for more aggressive play and one could play around with the possibility of skipping the shield on planet 1 (though I doubt that'd be feasible in a console speedrun, but who knows?). I'm more of a no-death type however, so that means there are none in this speedrun. Planet 1 - When first starting to attempt a speedrun of this game, I deemed it not feasible to use the warp on this planet. The warp disappears very quickly and there is normally no time to get both the shield probes (an absolute must) and the warp. Luckily, I accidentally fired off a shot at the warp once and noticed that that froze it in place (the other warps in the game don't work the same way). So, I shoot the warp before it disappers, tow the shield back to the mother ship and finally off to the warp again. Planet 7 - In a normal playthrough, you'll arrive here with boosters (from planet 2) that make the gravity more bearable. You'll also have the possibility to purchase items in shops prior coming here to get better weapons. Coming directly from planet 1 will very likely make a trip through this planet a bit rough. There is admittedly quite a lot of bouncing around going on. Especially the left side of the planet is difficult to get through. So yeah, the execution could be cleaner, but it's also very dependent on how much the enemies are gonna bother you (pretty much everything is random - bullet patterns, enemy behavior and spawns). Getting through untouched would be like getting an oil tanker through a bullet-hell shoot-em up. I believe it'd be possible to shave 30 sec off the time though, but it would sure require quite a few more attempts. Final note is about destroying the pod before entering the bonus zone. Without boosters, it's nigh impossible to collect all crystals in the bonus zone when in the pod. One interesting detail that makes it somewhat doable without boosters is that the vertical towing power is significantly increased when the ship is tilted slightly to the left ("11 o'clock"). The difference is huge compared to "12 o'clock" and understanding that part of the game physics was a big help to make this route possible. This planet still remains a chore however. Planet 8 - The pod's speed is not radially determined (I hope that term makes sense), but has instead a horizontal speed and a vertical speed. Both of these max out at 768 (not sure in what unit). Once you have the max horizontal speed, you only need to concentrate on the vertical speed. On planet 8 it's easy, the gravity is weak and negative, so the momentum carry the pod all the way to the location of the warp zone without using the thrusters. Planet 13 - Having picked up a few items in the shop, this planet is the first one where the pod feels somewhat maneuverable. I have a bit of trouble with the third fuel tank, but manage to adjust and push it into the wormhole. What happens while towing the fourth tank is more embarrassing. I thought I'd crash into the big enemy ship (has happened a few times) and therefore turned on the shields (=dropping the fuel tank). Lost a couple of seconds from having to realign. The rest of the planet goes reasonably well, but could have been faster. Planet 12 - First of all, the items equipped on the previous planet do not carry over to planet 12, so I always have to spend a bit of time equipping everything again. The execution is pretty good until I'm about to deliver the last fuel tank to the small wormhole. I approach it at a too steep angle and need to readjust, losing a couple of seconds. The underwater passage to the labyrinth then has a few more rough spots, partly due to bad enemy spawns, but I'm not without blame either. The area with the warpship part goes decently. Golden warpship - This is just a long shoot-em up sequence until the final boss and can't be sped up. The debris always appear in the same spots, but start to move around a bit randomly depending on how they're shot. At 24:00 in the video, I fire off a burst of shots against a huge debris blob, but you'll notice that they pass straight through! From emulator testing, I know that this changes some RAM-addresses' (0461, 0C61, 1461 and 1C61) value to 0. These addresses function as flags for the top eyeball of the final boss. With the value 0, it doesn't spawn. I have studied this on emulator and can see what's happening, but I don't know why (my TAS-skills are very rudimentary though, so that's not saying much). Anyways, getting the "despawning" is a one or two frame trick, but not something I could figure out how to do consistently. This was the first time happening for me in a console playthrough, so it was quite exceptional. I haven't found any pattern in the final boss. The timing for the eyeballs to become vulnerable seems random and when and how the debris is shot at you doesn't seem possible to predict either, so a fully optimized fight is not gonna happen. Compared with previous attempts, this was a pretty good fight and about 30 sec faster than my average (maybe 20-25 of those should be attributed to the despawned eyeball). I haven't found mention of anyone else having tried to speedrun this game. For information, this game was never released in Japan (like a few other Rare games by the way). I managed to despawn one of the eyeballs of the final boss. Even with a pretty nice-looking run, I'd still run into the risk of not beating this time. I haven't played this game in a couple of months, so an imminent improvement is not to be expected. I know there are mixed reactions about this game, but I think a speedrun of it looks pretty interesting. In between the mistakes, I think this run has a few good points that show off some of this potential. I do plan on revisiting this game as my next speedrun project, but I'll then first start looking at the potential for a no-warp run. I'm not sure when I get to that though. - SDA for publishing this run and for providing the community with a non-commercial platform for hosting speedrun videos. - Anyone who has contributed to the development of Anri-chan. If a tool is so easy that even I can encode videos, then it must good!